The Crazy Catch Wildchild Classic Rebound Net is a great cricket training aid used to help improve the skills of players of all ages and abilities whilst being great fun to use. Perfect for children to practise their catching in the back garden, at School or at their local Club this is the best catching net on the market. 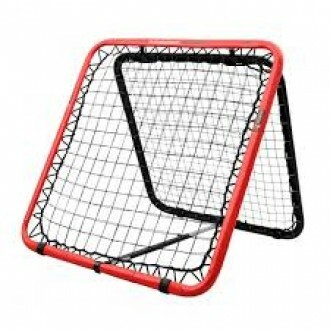 This Crazy Catch Wild Child Rebound Net is used extensively by cricket and hockey coaching companies around the World to improve reaction times and catching abilities. Durable with super strong patented net technology ...Highly strung!! The Crazy Catch Wildchild Classic is a great training aid used to help improve the skills of players of all ages and abilities whilst being great fun to use. The Crazy Catch is great to use to practice your catching skills both on the SANE for improving catching speed and throwing accuracy and on the INSANE to work on reactions with the ball rebounding in unpredictable ways replicating slip catching for example. The Crazy Catch rebound net is also the perfect coaching aid to improve all aspects of wicket keeping and for batting and bowling practice as well as for warm ups and various team games and practices. The Wildchild is our midrange model providing a large surface area in which to throw the ball onto whilst retaining its portable properties allowing coaches flexibility and the ability to alter a drill instantly by changing the angle or location of the Crazy Catch catching net. The Crazy Catch rebound net is also the perfect coaching aid to improve all aspects of wicket keeping and for batting and bowling practice as well as for warm ups and various team games and practices. The Wildchild is our midrange model providing a large surface area in which to throw the ball onto whilst retaining its portable properties allowing coaches flexibility and the ability to alter a drill instantly by changing the angle or location of the Crazy Catch catching net.